With less than two months to go before the start of the NBA playoffs, both the Eastern and Western Conferences are starting to take shape. With just 16 playoff places available in total, competition over the remaining few weeks will be intense. Now is just the right time for any playoff hopefuls to start to find their form and to look to put a run together that will take them to the finals beginning on June 4th. At this stage in the season, the big guns are just beginning to hit their straps and are looking to make their mark on basketball history. Last season Kawhi Leonard was named MVP in the finals, picking up the Bill Russell award as his San Antonio Spurs team beat the Miami Heat 4-1. Leonard was outstanding, averaging 17.8 points per game over the course of the five meetings and delivering 61% shooting accuracy. Few predicted Leonard's rise to prominence, and he has struggled to live up to expectations this year as the Spurs have disappointed in the Western Conference. But he may come to the fore again if San Antonio can sneak into the playoff picture. Other than Leonard, whose abilities are far more widely recognised now, there are any number of players who could make a significant mark between now and June. Whether it be a vital block, a steal or a nerveless free-throw in the final, NBA fans will look back to a performance by one man when they remember the 2015 season. The question remains, who will that man be? As the excitement builds ahead of the playoffs we look at the eight men who could have the biggest say on where the Larry O'Brien Championship Trophy ends up this season. Atlanta Hawks power forward Paul Millsap is enjoying an excellent season in 2014-15 and has been central to his side climbing to the top of the Eastern Conference. In his first 56 games of the campaign Millsap recorded a field goal attempt percentage of .471- a .15 improvement on his performance over the course of last season. Millsap has scored 942 points so far this season and is on course to at least match his 2014 tally of 1,328. Last season, his first since joining the Hawks from Utah Jazz, was Millsap's most productive in terms of points since he was first drafted in 2006. Having come into the NBA with high expectations after becoming the first man in NCAA history to lead the nation in rebounding for three consecutive years, he started his NBA career relatively slowly but soon became one of the Jazz's regular starters. The switch to the Eastern Conference came at just the right time for Millsap and last year he was named in the All Star team for the first time. Having been voted in by the coaches again this year, he will be hoping to cap his season with a playoff run. Throughout his nine years in the NBA the furthest Millsap has ever gone is to the Conference Final with the Jazz in 2007, at 30 years of age he will be hoping to go at least one stage further this year. Kyle Lowry may have been his own harshest critic in recent weeks - apparently referring to his game as 'trash' - but he has exceptionally high standards. If a man can be so self-critical, then it is clear that he has supreme talent. In Lowry's case, his talent is for scoring points and making the most of Toronto's possession. It is true that in recent weeks he hasn't been his usual self and much of this may have been down to securing his first ever NBA All Star call up a few weeks ago, securing a starting position for the Eastern Conference. If he can get back to the form he showed before the big game in New York, then Toronto will be confident of going all the way in the playoffs. The 28-year-old has amassed nearly 7,000 points during his career, and already scoring more 1,000 this season. Having been drafted by Memphis in 2006 before joining Houston then Toronto, Lowry has improved consistently throughout his time in the NBA and the only thing now missing is a playoff run. His longest post-season to date came in 2009 when he reached the Western Conference semi-finals with Houston. Pau Gasol is an NBA veteran currently in his 15th season in the US having initially been drafted in 2001 by the Memphis Grizzlies following a successful spell with Barcelona in his native Spain. Having spent a number of years with the Grizzlies, Gasol then moved on the LA Lakers and was traded again ahead of this season when he moved to the Chicago Bulls. At 7ft tall Gasol stands out amongst the field of NBA giants and he uses his gigantic frame to his advantage. Having endured a difficult few seasons, the European has returned to his best form since moving to the Bulls and was rewarded with an All Star spot - his first since 2011. Gasol's most prolific season came in 2010-11 when he scored 1,541 points. After 55 games of this season he has already scored more than 1,000 points and will be hoping to challenge his best if the Bulls make a playoff run. Gasol already has two NBA Championships to his name from his time at the Lakers, but he has not been past the conference semi-final stage since. Last season the Lakers failed to make the playoffs all together so Gasol will be desperate to make a mark this time around and ensure that the Bulls are amongst the contenders come the end of the season. It will be worth keeping an eye on the odds with the bookmakers of the likes of betfair and others, to see how the chances are rated. The Wizards currently sit fifth in the Eastern Conference and much of the success that they have enjoyed in recent months can be put down to the form of 24-year-old point guard John Wall. Wall has been with the Wizards ever since he was drafted in 2010, and the former University of Kentucky man has lived through a number of below-par seasons for the team. Last year, however, they made the playoffs for the first time since 2008, and, despite their conference semi-final defeat to the Pacers, they will have been pleased with their progress. This time they will be desperately hoping to better that performance. If the Wizards are to make it to the business end of the playoffs, then Wall, whose form was recognised with a second all-star call up a few weeks ago, will be central to that success. In his first 58 games of the season Wall recorded 987 points. In addition to this, Wall has 31 double doubles already this season (fifth best in the NBA) and is the top performer in the whole competition when it comes to assists (he averages 10.1 per game). If Wall performs to the best of his ability, then the Wizards are a very hard team to beat. Golden State Warriors Point Guard Stephen Curry is enjoying another outstanding season. Having picked seventh overall in the 2009 draft Curry always looked destined for big things, but injury struck as he became settled into the NBA and it was unclear whether or not he would ever fulfil his potential. Having missed much of the 2011-12 season with ankle and foot problems, he returned fitter, stronger and better than ever and he is now one of the most lethal point guards in the league. This season Curry has already scored more than 1,200 points at an average of 23.7 per game, and looks like coming close to matching his record of 1,873 points set last season. As well as boasting an impressive free throw percentage of .906 this season, Curry is also top of the NBA for steals and will be a vital part of Golden State's efforts in the remaining rounds of the regular season. Curry's form was rewarded with a second call up to the NBA all-star team this season, but he will now have mind firmly focused on team goals. During his time with the Warriors the closest they have come to NBA glory was a conference semi-final defeat to the San Antonio Spurs in 2012-13. Curry will want to make history and be a key part of the first Warriors Championship winning team for 40 years. Having already highlighted his older brother, Pau, as a key man in the run up to the playoffs it would be remiss to overlook the vital role that his younger brother, Marc, plays for the Memphis Grizzlies. The 30-year-old center was recently described in an article as being 'untradeable' and he has been central to everything that the Grizzlies have achieved this season. Gasol is the linchpin at the heart of the Grizzlies defense and, at 7ft 1" tall he forms a formidable barrier. He was rewarded for his personal efforts by being named as NBA defensive player of the year in 2013 and he been named in the all-star team twice, first in 2012 and then again this year. Gasol and his Grizzlies team-mates have made it to the play-offs in each of the last four seasons but the furthest that they have gone in the competition was to the conference final in 2012-13 when they were comprehensively beaten by the San Antonio Spurs. Houston Rockets' shooting guard James Harden is amongst the hottest property in the NBA right now. Having been drafted by Oklahoma City Thunder as third overall pick in 2009, Harden holds the distinction of being the Thunder's first ever draft signing. The 25-year-old enjoyed a successful three-year stint with Oklahoma, including reaching the 2012-13 NBA Finals where his team were beaten 4-1 by Miami Heat, before attracting attention from Houston and trading to the Rockets ahead of the 2013 season. Harden is a three-time NBA all-star (2013-15) and has continued to build upon his earlier potential since the trade. This season Harden averages 1.9 steals per game and is currently top of the NBA stats for average points per game. The former Arizona State man has already scored more than 1,500 points this season and looks likely to smash his record of 2,023 points scored in the 2012-13. If he can keep up his average of 27 points per game, then Houston will be extremely hard to beat in the coming months and they will be confident of reaching the NBA final for the first time since 1995. Portland Trail Blazers power forward LaMarcus Aldridge is currently in his ninth season with the Pacific Northwestern team and has consistently improved since he was initially selected as second pick, second overall by the Bulls in the 2006 draft. Having been traded straight away to the Trail Blazers it was unclear what the University of Texas man would achieve in the game but he has gone on to become a mainstay in the Portland team and has been central to all that they have achieved in recent years. Aldridge has recently been touted as a trade target for the NY Knicks but, for the time being at least, he will be going all out to deliver Portland's first NBA championship since 1977. This season Aldridge has already scored more than 1,100 points and is on course to match his best ever season. That best season was in 2010-11 when he scored 1,769 points. On a personal level Aldridge has been selected for the NBA all-stars in each of the last four years, and was named in NBA all-rookie first team in 2007. Despite this, Aldridge has yet to pick up the team silverware that his performances deserve and the furthest he has ever gone in post-season basketball was to the conference semi-finals in 2013-14 when the Trail Blazers were defeated 4-1 by the San Antonio Spurs. Stanislas Wawrinka has won the Quarter Final of Australia Open 2014 after beating Novak Djokovic (2-6,6-2,6-4,3-6,9-7). This is only the third time Wawrinka has beaten the World No. 2 Djokovic, and that too in a very important Quarter Final of the Grand Slam. Wawrinka will now face Thomas Berdych, who earlier beat David Ferrer in an exciting match. In a classic five setter Wawrinka showed greatest level of tenacity and upholding highest level of determination and was not let down by the Djokovic recent form and record. On the other hand this is Djokovic first loss since US Open 2013, where he was beaten by World No 1, Rafeal Nadal in the Finals. Liverpool defender Daniel Agger has insisted he has never been tempted to leave Anfield this summer despite being linked with a possible move to Barcelona. The Danish international has established himself as a firm fan favourite since his arrival from Brondby in 2006, racking up over 200 appearances for the Reds during that time. There had been various reports in the football betting news linking the centre back with a move to Barcelona this summer, but both the club and player have been quick to play down any talk of a transfer before the end of this current transfer window. While the club have never entertained the idea of selling Agger, the defender has made it clear he is settled at the club and privileged to have been made vice-captain this season following the retirement of Jamie Carragher. "I've said it so many times; I like it here and my family like it here. Not only the football but also living here, we fit in here and that's important for me," Agger admitted. After such a turbulent summer for the club with the whole Luis Suarez saga, Brendan Rodgers will now be hoping he can now just put his full focus into matters on the pitch. Agger committing himself to the club will be a huge boost to the team, and the Liverpool manager will now be hoping he can begin to start looking at players he can bring in rather than players who he might lose. The Tampa Bay Rays have been handed a boost following the news that left-hander, Matt Moore, is closing in on a return to the team in time to help mount a challenge for the AL East title. The All-Star starter has been sidelined since last month with an elbow problem but could now be in line to rejoin the rotation on September 3 for the trip to the Los Angeles Angels. Moore was 14-3 with a 3.41 ERA before Tampa Bay were forced to place him on the disabled list at the end of July for what was hoped would be a two- or three-week stay, only to be kept out for an extra couple of weeks due to the elbow injury taking longer to heal. Now back in full training, Moore is looking at getting his arm back 100% in order to get himself back on the mound as soon as possible. The Betfair baseball pages notes that Moore has had an excellent season so far, going 14-3 with a 3.41 ERA. Tampa Bay currently find themselves with a 74-54 record, one game behind the Boston Red Sox in the AL East. The Rays are tied with the Athletics for first place in the AL Wild Card, but the Indians, Orioles, and Yankees are all within touching distance of the Rays, with shortening odds in the MLB betting. After getting back to pitching in training, Moore admitted that he had felt the normal soreness he would after pitching in a regular game and would try to talk the management into letting him rejoin the rotation for the trip to Los Angeles. "Whatever gets me back in the rotation," he said, according to the Tampa newspaper. "That's the ultimate goal." Chicago Cubs pitcher, Jeff Samardzija, is resisting calls from his fellow professionals for pitchers to be given more protection against the possibility of a ball being struck straight back in their direction and he feels that, despite recent injuries, pitchers should accept the risks. Calls to improve pitcher safety have intensified after Tampa Bay Rays’ Alex Cobb was hit on the head on Saturday night; this followed another unsightly incident at the same ground back in May when J.A Happ of Toronto received a fractured skull after also being hit on the head. Despite these incidents, however, Samardzija was keen to stress that players knew the risks. "No one's forcing you to play this game, and we're not children," the 28 year old said. "We're playing big league baseball with grown men, so that's the risk you take when you play this game," he added. Samardzija, who had played college football, as well as baseball, at Notre Dame, had initially intended to play in both the NFL and the MLB but, after being selected as a fifth round pick in the 2006 draft he decided to focus his attention solely on baseball. Having significant experience of playing football at a high level, Samardzija knows all about protective equipment but he feels that protecting pitchers too much could affect the tradition and heritage of baseball. Samardzija’s view may be at odds with many of his fellow pitchers but it is clear that the MLB must act now to prevent further series injuries to their stars on the mound. Whatever is decided, Samardzija will be hoping that it does not affect his form as he looks to guide the Cubs away from the bottom end of the National League Central standings. Lionel Messi became the first Barcaplayer in 43 years to score 2 goals in the first 20 minutes of Match Day 1 of La Liga. Lionel Messi became the first Barcaplayer in 19 years to score in 3 consecutive Match Day 1′s of a La Liga season. Lionel Messi became the only player this century to score a total of 7 goals on Match Day 1 of La Liga (Forlan = 6, Negredo = 5). Lionel Messi became only the 3rd player to score a total of 5 goals vs Real Sociedad at Camp Nou (After Rivaldo & Juan Manuel Asensi). Lionel Messi became the only player in the history of Barcelona to score 18+ Clásico goals (Earlier, César Rodríguez Alvarez = 14). Lionel Messi became the only player in the history of Barcelona to score 7 goals at Camp Nou vs Real Madrid (Evaristo de Macedo = 6). Lionel Messi became the only player in the history of the Supercopa de España to score in 4 consecutive editions (2009, 2010, 2011, 2012). Lionel Messi became the only player in the history of La Liga to score a brace in each of the first two games of the season. Lionel Messi became the only player in the history of Barcelona to score 10 league goals against Osasuna (Samuel Eto’o = 8). Lionel Messi became the only player in the history of Barcelona to score the most away goals (5) in La Liga vs Osasuna (Luis Suárez Miramontes, Eulogio Martínez, Francisco José Carrasco = 3). Lionel Messi became the first player in 11 years to score in six consecutive games for Argentina. Lionel Messi surpassed his personal record of 60 goals in a calendar year during 2010, by scoring his 61st against Getafe. Lionel Messi became the first Barcaplayer in 59 years to score three braces in the first four league games of La Liga (László Kubala, 1953/54). Lionel Messi became the first player in 18 years to score 3 braces in the 1st four league games of La Liga (Iván Zamorano, 1994/95). Lionel Messi became only the 8th player in the history of La Liga to score 3 braces in the 1st four league games (Olivares, Mariano Martín, Pahiño, Zarra, Kubala, Puskas, Zamorano). Lionel Messi became the first Barcaplayer in 51 years to score 6 goals in the 1st four games of La Liga (Evaristo de Macedo, 1961/62). Lionel Messi became the first player in 13 years to score 6 goals in the 1st four games of La Liga (Salva Ballesta, 1999/00). Lionel Messi became only the 2nd player in the history of La Liga to score 5 goals at Getafe’s Coliseum Alfonso Pérez stadium (Roberto Soldado = 5). Lionel Messi became only the 2nd player in the history of football to win the Onze d’Or award three times in a row (Michel Platini, 1983-1985). Lionel Messi became the only player in the history of Barcelona to score 100 league goals at Camp Nou. Lionel Messi became the only player in the history of Barcelona to score 150+ goals at Camp Nou. Lionel Messi became the only player in the history of Barcelona to score 6+ league goals against Real Madrid at Camp Nou (Evaristo de Macedo & Gary Lineker = 5). Lionel Messi became the first Barcaplayer in 18 years to score 2 goals from direct free-kicks in a Clásico (Ronald Koeman, 1992-1994). Lionel Messi became the first player in 13 years to score 2 goals from direct free-kicks in a Clásico (1998/99). Lionel Messi became the only player to score 9 league goals against Iker Casillas (Samuel Eto’o = 8, David Villa = 7). Lionel Messi became the only player in the history of El Clásico to be directly involved in 29 goals (18 goals, 11 assists). Lionel Messi (25y-110d) became the 5th youngest player in history to score 9 World Cup qualifying goals (after Marcelo Salas, Tostão, Obafemi Martins and Luis Suárez). Lionel Messi became the only player to score 2 free kicks during the CONMEBOL 2014 World Cup qualifying tournament (Dorlan Pabón, Juan Arango, James Rodríguez = 1). Lionel Messi became the only player to score 12+ goals for his country in 2012. Lionel Messi became only the 10th player in the history of Argentina to play 75 times for the national team (Javier Zanetti = 145). Lionel Messi became only the 2nd player in the history of Argentina to score 12 goals for the national team in a calendar year (Gabriel Batistuta, 1998 = 12). Lionel Messi (59) broke his personal record of club goals in a calendar year, surpassing his previous personal best of 58 in 2010. Lionel Messi (43) broke his personal record of league goals in a calendar year, surpassing his previous personal best of 42 in 2010. Lionel Messi became the only player in the history of La Liga to score 59 goals in a calendar year (Cristiano Ronaldo = 43 in 2011). Lionel Messi became the only player in the history of Barcelona to score 16 hat-tricks in La Liga (César Rodríguez Álvarez = 14). Lionel Messi became the only player in the history of Barcelona to score 5 away hat-tricks in La Liga. Lionel Messi became only the 2nd player in the history of Barcelona to score 6 goals at Deportivo de La Coruña’s Municipal de Riazor stadium (László Kubala = 6, Ronaldinho = 5). Lionel Messi became the first Barca player in 62 years to score 11 goals in the first eight league games (César Rodríguez Álvarez, 1950). Lionel Messi became the only player this century to score 13 goals in the first nine league games of La Liga (Salva Ballesta, 1999/00). Lionel Messi became the only player in the history of Barca to score 4 away league goals vs Rayo Vallecano (Koeman = 3). Lionel Messi became the joint 10th player in the history of La Liga to score 182+ goals (Juan Arza). Lionel Messi became the only player in the history of Barcelona to score 23+ international goals (club and country) in a calendar year. Lionel Messi became only the 2nd player in the history of Barcelona to score 4 goals against Scottish opposition (Sándor Kocsis). Lionel Messi became only the 8th player in the history of La Liga to score 15 goals after the first 11 games of the season (Bata, Lángara, Pruden, Echevarría, Mariano Martín, Zarra, César). Lionel Messi became the first player in 62 years to score 15 goals in the first 11 Liga games of the season (César, 1950/51). Lionel Messi became the only player in the history of La Liga to score 11 goals in the first 6 away games of the season. Lionel Messi became the only player in the history of Barcelona to score 6 league goals away at Mallorca (Kluivert = 5). Lionel Messi became the only player in the history of La Liga to score 11 goals against Mallorca (Tamudo = 10). Lionel Messi surpassed Pelé’s South American record of 75 goals in a calendar year, set in 1958, by scoring his 76th goal of 2012 away to Mallorca. Lionel Messi became the only player in the history of Barcelona to score 6 goals vs Real Zaragoza at Camp Nou (Basora & Begiristain = 5). Lionel Messi became only the 2nd player in the history of La Liga to score 2 or more goals in a single game 55 times (Zarra = 76, Di Stéfano = 54). Lionel Messi became only the 3rd player in the history of La Liga to score 13 goals vs Real Zaragoza (Ferenc Puskás, Raúl). Lionel Messi became the first player in 64 years to score 17 goals in the first 12 Liga games of the season (César, 1948/49). Lionel Messi became the joint 9th player in the history of La Liga to score 186+ goals (Santillana). Lionel Messi became only the 2nd player in the history of the Champions League to score in 19 different cities (Raúl = 19, van Nistelrooy = 18). Lionel Messi became the only player in the history of the Champions League to score 25+ away goals (van Nistelrooy = 24). Lionel Messi became the only player in the history of Barcelona to score 4 goals vs Spartak Moscow (Romário, Koeman & Stoichkov = 2). Lionel Messi became only the 2nd player in the history of football to score 25 international goals (club & country) in a calendar year (Vivian Woodward, 1909). Lionel Messi became the first player in the history of the Champions League to score 13 goals in a calendar year (Cristiano later equalled this record). Lionel Messi became only the 2nd player in the history of Barcelona to score 7 goals vs Levante (Cayetano Ré). Lionel Messi became the only player in the history of La Liga to score 2+ goals in 4 consecutive away games (3 vs Deportivo, 2 vs Rayo, 2 vs Mallorca, 2 vs Levante). Lionel Messi became the first player in 69 years to score 19 goals in the first 13 Liga games of the season (Echevarría & Martín, 1943/44). Lionel Messi became the only player in the history of football to be on the list of the final 3 nominees for the FIFA Ballon d’Or award, on six occasions (2007-2012). Lionel Messi became only the 2nd player in the history of football to score 72 club goals in a calendar year (Gerd Müller, 1972). Lionel Messi became the only player in the history of Barcelona to score 21 goals in the first 14 Liga games of the season. Lionel Messi became only the 4th player in the history of La Liga to score 21 goals in the first 14 league games of the season (Bata, Lángara & Pruden). Lionel Messi set a new personal record of scoring 2+ goals in 5 consecutive games for Barcelona (March 2010 = 4 consecutive games). Lionel Messi (228 games) became only the 2nd player in the history of Barcelona to score 190+ goals in La Liga (César Rodríguez Alvarez, 287 games). Lionel Messi became the only player in the history of Barcelona to score 191+ league goals (César Rodríguez Alvarez = 192). Lionel Messi became the only player in the history of football to score 79 club goals in a calendar year (Gerd Müller = 72, 1972). Lionel Messi became only the 2nd player in the history of La Liga to score 89+ away goals (Hugo Sánchez = 99, Raúl = 87). Lionel Messi became the only player in the history of football to score 91 goals in a calendar year (Gerd Müller = 85, 1972). Lionel Messi became only the 2nd player in the history of football to win the World Soccer Player of the Year award 3 times (Ronaldo). Lionel Messi became the only player in the history of football to be nominated for the Laureus World Sportsman of the Year award, 4 consecutive times. Lionel Messi became the only player in the history of La Liga to score 26+ goals in the first half of the league season (Cristiano = 23). Lionel Messi became the only player in the history of Barcelona to score 12 league goals vs Atlético de Madrid at Camp Nou (César Rodríguez Alvarez = 11). Lionel Messi became the only player in the history of La Liga to score 16 goals against Atlético de Madrid (César Rodríguez Alvarez = 15). Lionel Messi became the first player in 72 years to score 25 goals in the first 16 league games of the La Liga season (Pruden 1940/41). Lionel Messi became only the 3rd player in the history of La Liga to score 25 goals in the first 16 league games of the season (Bata 1930/31, Pruden 1940/41). Lionel Messi became the only player in the history of Barcelona to score a brace in 6 consecutive league games. Lionel Messi became only the 2nd player in the history of La Liga to score a brace in 6 consecutive league games (Telmo Zarra = 7, 1946/47). Lionel Messi became only the 8th player in the history of La Liga to score 196+ goals. Lionel Messi became only the 3rd player in the history of La Liga to score 27 goals in the first 18 league games of the season (Bata 1930/31, Pruden 1940/1941). Lionel Messi became the only player in the history of football to win the FIFA Ballon d’Or award 4 times (Platini, Cruyff, van Basten = 3). Lionel Messi became the only player in the history of La Liga season to score 28 goals in the first half of the season (Cristiano 2011/12 = 23 goals). Lionel Messi became only the 2nd player in the history of La Liga to score 28+ goals in the first 19 league games of the season (Pruden 1940/41). 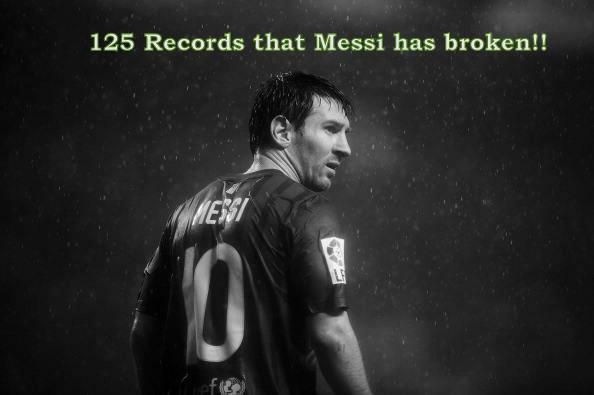 Lionel Messi became the only player in the history of La Liga to score 17 away goals in the first half of the season. Lionel Messi became the only player in the history of Barcelona to score 10 league goals against Málaga. Lionel Messi became only the 3rd player in the history of La Liga to score 10 league goals against Málaga (Tamudo = 12, Cristiano = 10). Lionel Messi became only the 2nd player in the history of La Liga to score 29+ goals in the first 20 league games of the season (Pruden 1940/41). Lionel Messi became the only player in the history of Spanish football to score 40+ goals in four consecutive seasons. Lionel Messi became the only player to score more than three goals in a league game on 3 separate occasions this century (Cristiano = 2). Lionel Messi became only the 2nd player in the history of La Liga to score 33 goals in the first 21 league games of the season (Pruden 1940/41). Lionel Messi became the first Barca player this century to score 18 penalties in La Liga at the Camp Nou (Ronaldinho = 17). Lionel Messi became only the 3rd player in the history of Barcelona to score 13+ consecutive penalties in La Liga (Ronald Koeman = 25, László Kubala = 22). Lionel Messi became the only player in the history of Spanish football to score 30+ league goals in 4 consecutive seasons (34 – 31 – 50 – 37 ongoing). Lionel Messi (2009-13) became only the 3rd player in the history of Europe’s big 4 leagues to score 30+ league goals in 4 consecutive seasons (Dave Halladay 1925-29 & Jimmy Greaves 1960-64). Lionel Messi became the only player in the history of La Liga to score in 17 consecutive match days (Mariano Martín 1942/43 – 1943/44 & Ronaldo 1996/97 = 10 games). Lionel Messi became the only player in the history of La Liga to score in 17 consecutive match days in a single season (Ronaldo = 10, 1996/97). Lionel Messi (25y-217d) became the youngest player in the history of La Liga to score 200 goals (Telmo Zarra = 29y-352d). Lionel Messi became only the 8th player in the history of La Liga to score 200+ goals. Lionel Messi became the only player in the history of La Liga to score 14 goals against Osasuna (David Villa = 13). Lionel Messi became only the 4th player in the history of La Liga to score 16+ hat-tricks (Di Stéfano, Zarra = 22, Cristiano = 17). Lionel Messi became the first player in 52 years to score 3 pokers (4 goals in a match) in La Liga (Kubala, Di Stéfano = 1961). Lionel Messi became only the 5th player in the history of La Liga to score a poker vs Osasuna (Armando Merodio in 1959, Quique Setién in 1984, Xavier Escaich in 1994, Ruud van Nistelrooy in 2006). Lionel Messi became the only player in the history of La Liga to score 34 goals in the first 22 league games of the season (Pruden = 33 goals, 1940/41). Lionel Messi became only the 3rd player in the history of Barcelona to score 26 penalties in La Liga (Koeman = 45, Kubala = 26). Lionel Messi became the only player in the history of La Liga to score 35 goals in the first 23 league games of the season (Zarra = 30 in 1950/51). Lionel Messi set a new personal record of scoring 22 away league goals, surpassing his personal best of 18 during 2009/10. Lionel Messi set a new personal record of scoring 29 goals outside Camp Nou, surpassing his previous best of 27 during 2011/12. Lionel Messi became only the 2nd player in the history of La Liga to score 22 away league goals in a season (Cristiano = 23). Lionel Messi became the only player in the history of La Liga to score in 11 consecutive away games in a season (Cristiano = 8, 2011/12). Lionel Messi became the only player in the history of Barcelona to score in 13 Liga away games in a single season. Lionel Messi became only the 4th player in the history of Spanish football to score 306+ goals for a single club (Zarra = 335, Raúl = 323, Di Stéfano = 307). Lionel Messi (ARG) became the only foreigner to play 25 Clásicos (Roberto Carlos BRA = 24, Luís Figo POR = 23). Lionel Messi (2007-2013) became only the 2nd player in the history of El Clásico to score 18 goals (di Stéfano, 1953-1963). Lionel Messi (328 goals) became the 3rd highest scorer in official & friendly games in the history of Barca (Alcántara = 369, Samitier = 333). Lionel Messi became the only player in the history of Spanish football to score 50+ goals in three consecutive seasons (2010/11 = 53. 2011/12 = 73. 2012/13 = 53). Lionel Messi became only the 2nd player in the history of the top 4 leagues to score 40+ goals in 2 consecutive seasons (Cristiano, 2010/11 & 2011/12). Lionel Messi became the only player in the history of football to score in 17 consecutive league games (Teodor Peterek = 16, 1937/38). Lionel Messi became only the 2nd player in the history of the Champions League to score 5+ goals against AC Milan (Wayne Rooney = 6). Lionel Messi became the only player this century to score 58 goals in the Champions League (Raúl = 56, van Nistelrooy = 48). Lionel Messi became only the 2nd player in the history of the Champions League (main tournament) to score 58+ goals (Raúl = 71, van Nistelrooy = 56). Lionel Messi became the only player in the history of the Champions League to score 16 braces (Raúl = 14). Lionel Messi became the only player in the history of the Champions League to score 28 goals in the knock-out stages (Cristiano = 22). Could this summer stage the worst Ashes ever? The standard of English and Australian cricket has come under major scrutiny this week after both international Test sides proved far from convincing in respective touring series. While England stare down the were nearly going down to an embarrassing 1-0 series defeat to New Zealand thanks to life saving century by Matt Prior, Australia suffered a humiliating whitewash at the hands of India to lose 4-0 for the first time since South Africa in 1970. The two series results mean neither side carries much form heading into the English summer, where fans in the Ashes cricket betting world are eagerly anticipating another round of Ashes action. Unfortunately for Australia, their loss in India is probably more concerning than England’s poor display in New Zealand. Team and coaching issues, poor performances and an inability to handle a turning subcontinent wicket have blighted the Baggy Greens’ tour. Vice-captain Shane Watson was dropped then reinstated, while Michael Clarke’s back injury is a major concern as his absence in the fourth Test proves just how fragile their top order really is. A series whitewash is never a good thing but against India – who lost to England 2-1 on home soil last winter – it is a disaster for Australia as we draw closer to the Ashes. England, meanwhile, have shown their weakness when captain Alastair Cook slumps in form and Kevin Pietersen’s injury exposes the same fragility in the order that Australia are struggling to rectify. With their bowlers performing below par without the injured Graeme Swann, England and Australia are gearing up for what could be one of the worst Ashes series in living memory. Not that this will take away from the drama – betting on England to win will see to that – but fans can expect little consistency to settle in over the five-match series. Former Captain of Pakistan Cricket Team Imran Khan turned politician currently Chairman of Pakistan Tehreek e Insaf will proceed with a Rally/ Jalsa at Iqbal/Manto Park today at 23rd March 2013. This Rally will be the defining campaign in the Punjab Region for PTI before the polls to be held in May 2013. What Imran khan has mentioned it be a Mega-Tsunami which will revolutionise the country , and take away the family mafia of politics and usher a new era of progressive democracy in Pakistan which Muhummad Ali Jinnah had envisioned for. Morever This rally will take along the lines to give guideline to new and improved Pakistan.